One of the most popular casino games is undoubtedly Roulette, which means little wheel in the country of its origins, France. Interestingly enough, the wheel was developed by accident by the French mathematician Blaise Pascal during his quest for a perpetual motion machine. Inevitably, the game’s popularity gave rise to a number of variations and subsequent strategies. The main two forms are European Roulette and American Roulette, played with one and two zeroes, respectively. Another form is Californian Roulette, which is the only legal form in the state after which it was named. The main difference is that it is played with cards instead of numbers. Some variants get rid of the wheel altogether, but others have a wheel that only has red and black slots and while it is spinning, the dealer will draw a card for each color and the color that is hit will point out the winning card. The main betting options in roulette can be divided into two categories: inside bets and outside bets. The inside section offers bets on individual numbers, a combination of neighboring numbers, and groups of up to six numbers, where the payouts range from 35 to 1 (single number) to 5 to 1 (betting a line). The outside section offers pairs of bets for red or black, high or low, odd or even, and the dozens and columns, which all pay 1 to 1 with the exception of the dozens and columns, which pay 2 to 1. Additionally, bets can be placed in the so-called racetrack, which enables the player to bet on numbers that are physically located nearby on the roulette wheel. 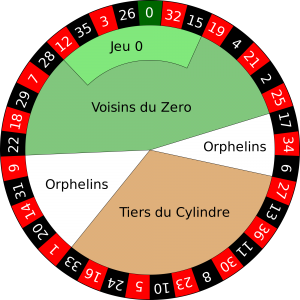 Furthermore, it allows for four special types of bets which are called Voisins du Zero, Tiers du Cylindre, Orphelins en Plein, and Jeu Zero. Finally, one can bet on so-called splits, which are adjacent numbers of the same color on the main layout. The wealth of betting options compared to slots, naturally leads to a wide range of strategies that one can play. In the past, many employed prediction methods which were exploiting the imperfections of a roulette wheel. Even though there are still prediction strategies that claim to have an edge over the house, such methods are generally not very viable strategies anymore, as the wheels of most casinos are regularly balanced and realigned. There are, however, a number of betting strategies that theoretically could raise your expected value over the house’s. The most famous one is the Martingale betting strategy, which was originally developed for winning a simple heads or tails game. This technique is employed in other areas as well, such as trading. The basic premise of the Martingale roulette strategy is to make a 1 to 1 bet (such as picking a color or betting low or high), and if you lose you will bet enough to recover the loss plus a small profit. The system will repeat until you win, after which you start over again. 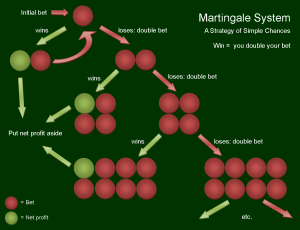 The Martingale strategy can also be employed in reverse. This way, the player will increase the bets when he wins and decrease them when he loses. The idea is that if one goes on a hot streak, one will increase the profits while limiting the losses in case of a dry streak. Another variant is the Labouchère betting system, where the player decides on the amount he wants to win beforehand and makes a list of positive numbers that sum to the predetermined amount. With every bet, the player then stakes an amount equal to the sum of the first and last number of the list and when won, the two amounts will be removed from the list. When the bet is lost, the sum will be added to the end of the list. This sequence continues until all the numbers are removed from the list (in which case the player will have won the predetermined win) or until the player runs out of money. One other popular betting strategy is the D’Alembert system, which is similar to the Martingale strategy, but easier to employ. It is mostly focused on the even-money bets like the Martingale, but in this case the player adds one unit after a loss, and deducts one unit on the wager after a win. Similar techniques can be employed on the dozens bets. The most profitable betting strategies are usually the betting strategies rather than the prediction methods. In any case, roulette will likely remain one of the most popular casino games for years to come as its variety and excitement appeal to many people around the world.